If you are interested, please also have a look at my other Natural Toys posts: Branch Building Blocks, Table with Armchairs, Lookout with Stairs, Ramp with Trees, and Feeding & Watering Trough. STEP 1: Collect one thin (0.6-inches-thick; i.e., 1.5 cm thick), one medium (0.8-inches-thick; i.e., 2.2 cm thick), and one thick branch (4-inches-thick; i.e., 10 cm thick), dry them, and cut slices of different thicknesses/lenghtes (see step 2). For more details on branch selection, drying, and cutting please refer to my first post about Waldorf-inspired Branch Building Blocks. 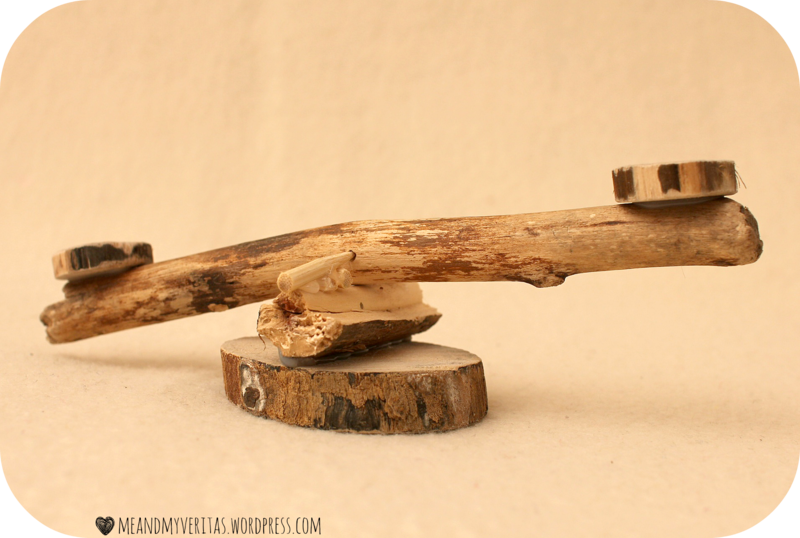 STEP 2: From the thin branch, cut a 5.5-inches-long (i.e., 14 cm) piece for the moving horizontal part of the seesaw. From the medium branch, cut 2 slices of 0.4 inches (i.e., 1 cm) for the two seats and a 2 inches (i.e., 5 cm) long piece for the bearing (see step 5). From the thick branch, cut a 0.8 inches (i.e., 2 cm) thick slice for the base. STEP 3: Sand all pieces in order to remove any rough edges and small splinters. STEP 4: Glue one seat onto each end of the thinner branch. STEP 5: By using a carving tool, carefully shape the 2 inches long medium branch piece as shown below. Basically the shape is that of a half twig/branch with a hill in the middle. 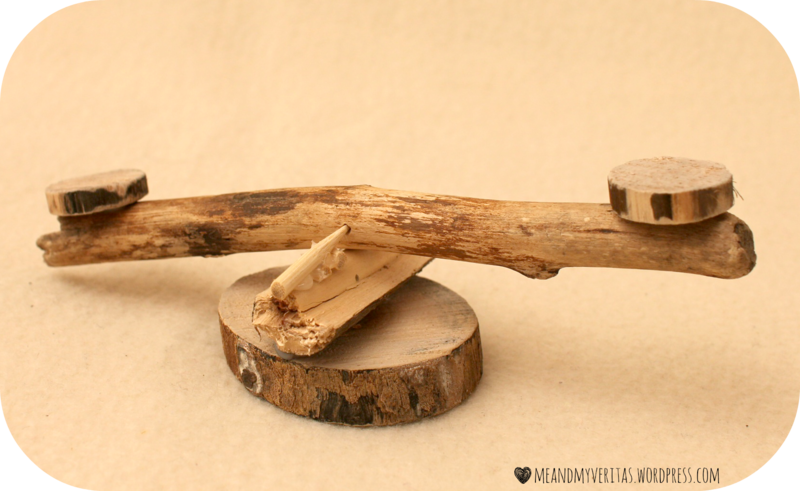 Alternatively you can cut the branch piece into halves and glue on half of an appropriate twig. The whole construction needs to be round and smooth at the top, because this is where the seesaw’s arm will sit on. The lesser the contact area here, the better the rocking ability. STEP 6: Glue the construction from step 5 onto the thick branch slice using a hot glue gun. STEP 6: Take both shashlik skewer and cut 2 inches (i.e., 5 cm) long pieces from the pointy ends. 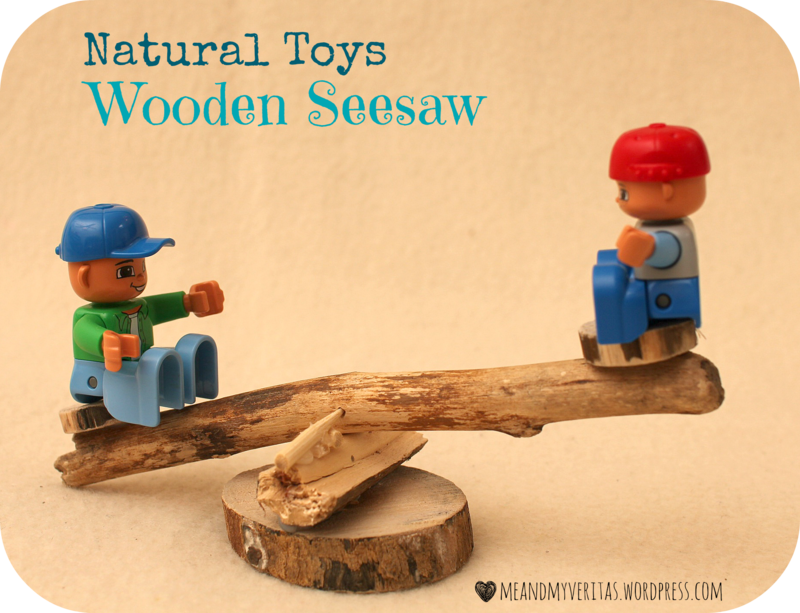 Using a Dremel tool or a nail and hammer carefully make a hole into each side of the seesaw arm. Position these holes at the middle of the arm. In these holes the guides (shashlik skewer) are going to sit in. STEP 7: Put the guides into the holes and on the other end glue them onto the bearing construction from step 6. 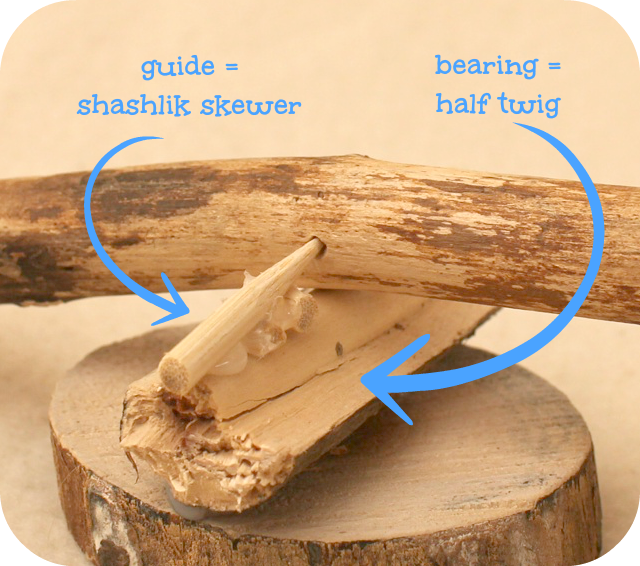 As you can see in the picture below I also slid some smaller pieces of the shashlik skewer under the main shashlik skewer (in the pic this is where it unfortunately does not look very neat) to make the guides a bit more stable. This step is a bit fiddly, so take your time. 🙂 Do not glue the pointy ends into the hole. Just insert the ends; they need to be able to move freely in order to ensure that the seesaw is rocking in the end. That’s it. You are done. Super easy. Here it is again in all its beauty. 🙂 How do you like it? I have more Natural Toys Tutorials here and will publish more soon! So please stay tuned! Please click here and leave a comment…. Ich freue mich auch sehr über Kommentare auf Deutsch. I am linking this to Kiddikram, Made4Boys, and Talented Tuesday. This is so sweet! Shame I only have like one of the tools required but it’s very clever! I can imagine kids love it! I love it! This is a great way to enhance your child’s creativity! Please check out my blog as well. I am a therapist from CA and I just started blogging myself!